So you are looking to build bigger arms and a bigger more muscular rest of your body as well? It can be achieved but you have to know a few of the best techniques, strategies and exercises to help you get to where you want to be in terms of building mass. Building mass in your arms or building massive chest, even though they are completely different muscle groups, they both will require you to do some of the same techniques. The focus here will be to talk about building muscular arms. The following will be a set of high-intensity exercises that you can do but they have to be done with you completely giving your all if you are looking for the best results. Some tips: If you measure your arms in the morning before you work out, this will give you a true reading of your size before working out or even just the daily activity that can plump up your muscles which leads to building mass. Some trainers that have done a lot of research, believe that you should only train your arms twice a week so that you give your arms the best chance of recovery and muscle growth. Exercises Examples: Biceps Curl with Barbell – You want to focus on a little lighter weight for this exercise. The key here is that you do not want to pause at the bottom of the exercise. You want to have the exercise be one continuous motion from the lowering of the weight to the lifting of the weight to keep the bicep continuously working. Add this technique to the amount of reps that you are doing with your workout which will help in building mass. Slowest Possible Chinup – The idea here is that you want to lift your body weight and lower your body weight with the slowest possible movement that you can do. The goal is to compete both the up and the down putting the most strain on the muscle to build mass size to your arms. Try to shoot for 25 to 30 seconds on both the raising and lowering of your body. Slowest Possible Dips – The idea here is the same as the chinup. 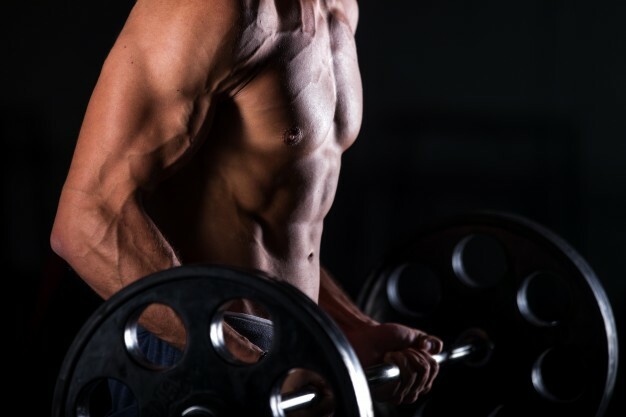 You want to do your dip as slow as possible to put the same amount of strain on the arm muscles to gain the muscle size you are looking to achieve. Single Arms Triceps Extensions – Use a moderate amount of weight and you want to put the focus on your triceps. Keeping the weight close to your ears, raise the weight above your head. Slowly lower the weight behind your head by bending at the elbows but keeping your elbows facing forward. Do 8 to 12 of these reps or do the amount you are currently working with in your program. Those are just a few of the exercises that you can rotate into your mass building muscle workout if this is your goal for now. To build biceps and to sculpt the muscle, you have to make sure that you are isolating the exercise to the muscle group that you are focusing on. To build muscle in your arms, you have to know that it will take a toll on your body, so make sure you are giving your body the rest and high protein diet it needs for muscle growth and recovery. Practice these exercises for a least a few months and you will see some big gains in packing on some solid muscles mass quickly.